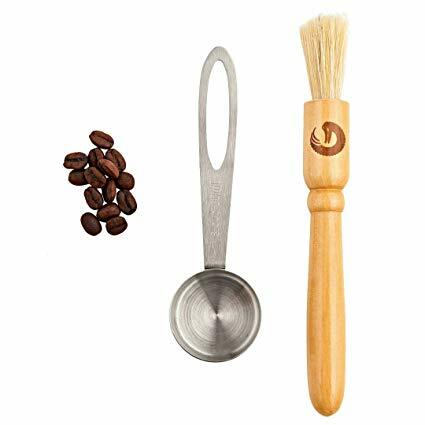 Today we want to talk about the item we use almost every day, but rarely pay any attention to it – a scoop, and more to the point – a coffee scoop. 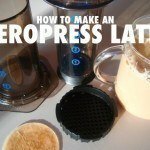 How to measure coffee to make the perfect cup of coffee? How many scoops of coffee do i need for 12 cups? 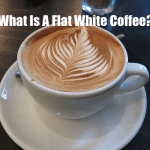 What is a “cup” of coffee? Plastic, ceramic or stainless steel coffee scoops? Which one you should use? Alright, get out your scoop collection and let’s get into this puzzling topic. Ok, let’s get some things straight! 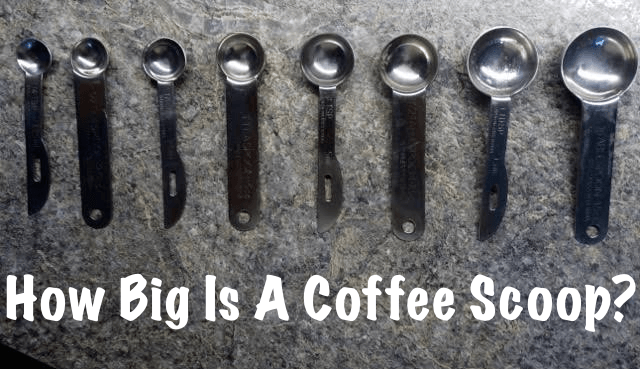 Scoops can come in all kinds of sizes and shapes, thus making it hard to decide what size and type of scoop you should use for making your coffee. The amount of coffee you use when preparing yourself a cup of coffee determines the flavor and strength of your cup. 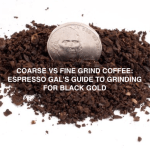 A standard full coffee scoop usually holds around two regular tablespoons of coffee grounds. If you are not sure about the size of your coffee scoop, you can easily find it out by using a regular tablespoon and some water. Fill up your tablespoon with water and then pour it into your coffee scoop. Now repeat the same process. Two full tablespoons of water should fully fill one coffee scoop. Now, let’s talk about measuring..
We all like to measure and keep track of all sorts of things in our daily lives. We keep track of time, monitor our health, keep track of our daily calories intake, etc. We also like to apply the same concept towards coffee making by measuring the ground coffee. The thing is, we don’t like changes, especially when it comes to something we do each day, like making a nice hot brew. That’s why it is important we use the same amount of coffee each time we are making ourselves a brew. The accurate amount of coffee we use ensures the best results in the brewing process. Of course, the most accurate way to measure coffee is by weight. 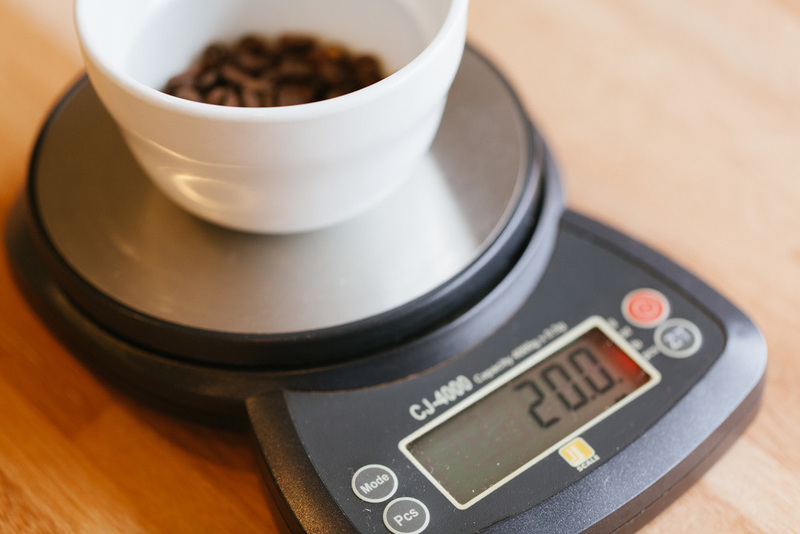 A good digital kitchen scale will help you easily achieve a proper coffee brewing ratio. The brewing ratio is the amount of coffee used in relation to the amount of water you use to prepare your brew. As a general rule, you should use approximately 10 grams or 0.36 ounces of ground coffee for 6 ounces of water. 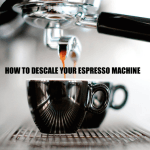 Maintaining a proper brewing ratio is essential for a nice cup of coffee and can be easily attained, although for some people it might sound complicated in the beginning. If you are not so adventurous or don’t have time to weigh your ground coffee, you can use a coffee scoop. As already mentioned, the classic standard scoop will hold around 10 grams or 0.36 ounces of ground coffee. 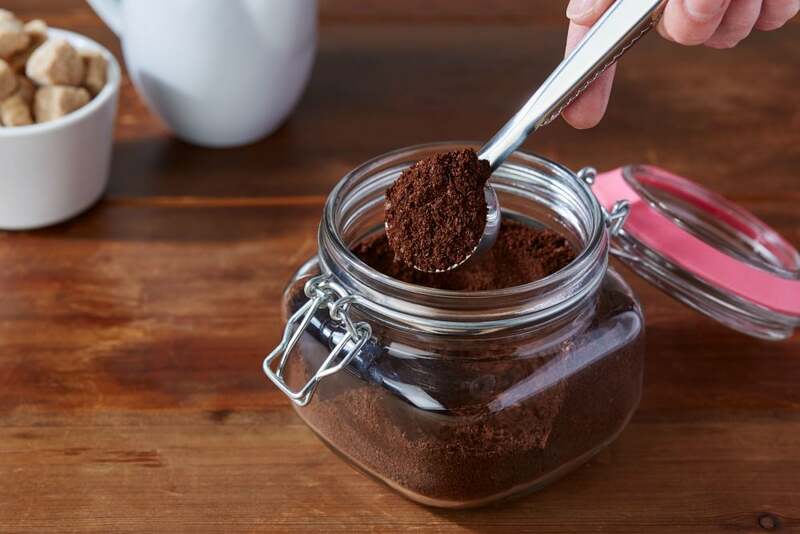 If you don’t have a coffee scoop, you can use a tablespoon instead. The classic scoop holds 2 tablespoons of ground coffee. Measuring the amount of coffee to be used and getting the proportion of coffee to water exactly right can sometimes be tricky. 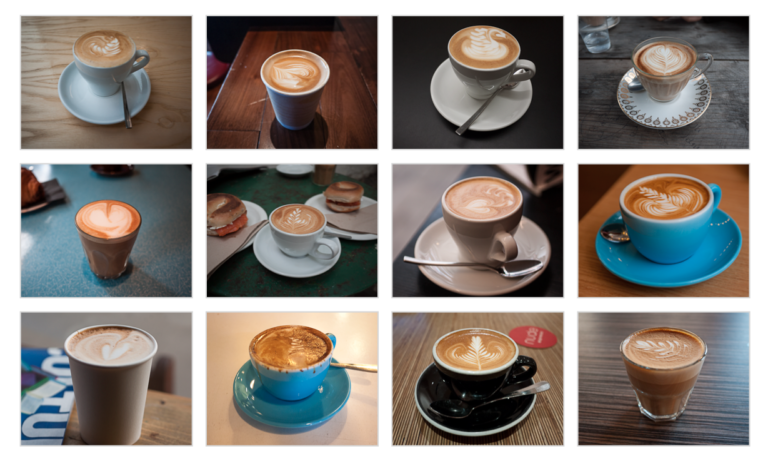 First, let’s talk about the difference between a coffee cup and a coffee mug. Yes, these two are different. 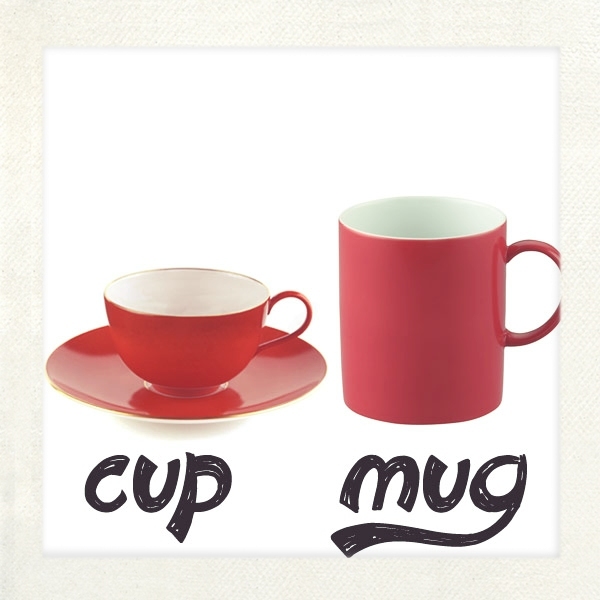 A coffee cup (which is the same size as a tea cup) is around 6 fluid ounces (180 ml). A coffee mug is about 8 fluid ounces (230 ml). Like we already mentioned, the standard rule is to use 0.36 ounces (10 grams) for every 6 ounces of water. In other words, you should use one coffee scoop or 2 tablespoons of ground coffee for every 6 ounces of water. 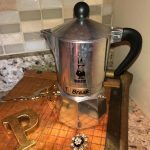 So, if you need to make 12 cups of coffee, you will need 72 ounces of water (2.1 litters) and 12 scoops of ground coffee (120 grams). 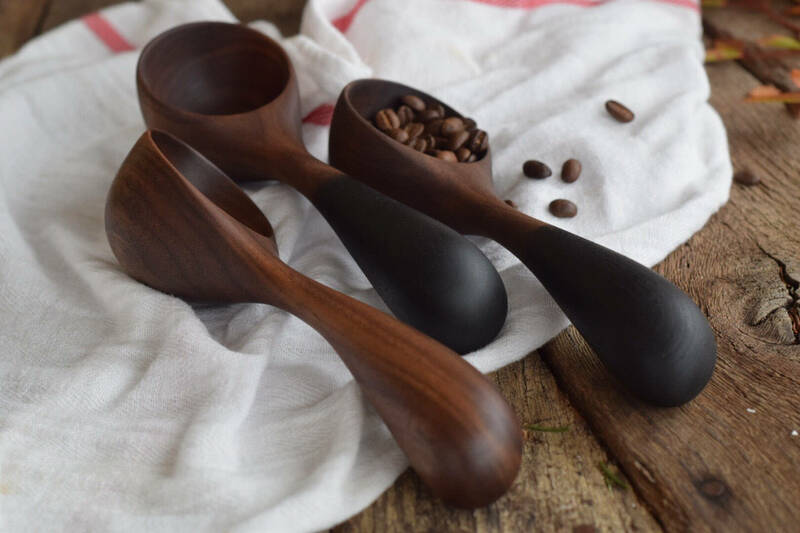 Knowing what a coffee scoop is is good to know, but on top of that, there’s cup sizes to consider. There is your standard mug…but wait, what is your “standard” size mug? There are a million different mug sizes. 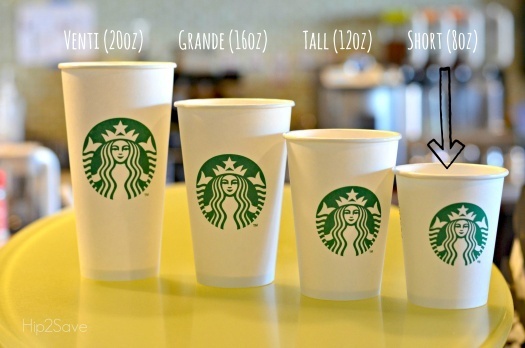 If you go to Starbucks, you have to deal with their coffee cup sizes which have fancy Italian names, each holding a specific amount of drink. It seems that once you go outside of the standard 8oz cup of coffee, things start to get complicated once again! These Starbucks sizes are measured in fluid ounces, with Venti being 20oz, Grande being 16oz, Tall being 12oz, and Short being 8oz. Everyone orders something different, but you can see that our “standard” size cup of coffee is considered the Starbucks’ “small” size. Just remember – if you’re going after a large cup of coffee, two level scoops from your RSVP coffee scoop to 16oz of water is what you want, and that should fill up a large cup. You’ve carefully selected an amazing coffee maker, bought your favorite brand of coffee, and got your favorite mug. But, have you thought about your coffee scoop? Have you ever wondered whether you should use plastic, ceramic or stainless steel scoop? Plastic scoops can develop some scratches over time. Scratched surfaces can easily trap all sorts of bacteria. As bacteria get trapped in tiny scratches, plastic scoops are hard to be fully cleaned. Some plastic scoops can contain BPA (bisphenol A). BPA can leak into food or beverages and can have negative effects on our health. Ceramic coffee scoops break easily. So, if you drop it from your kitchen table, it will probably break. Glaze that is used to make ceramic scoops look smooth and shiny sometimes contain lead or some other chemicals that are not food safe. They are almost unbreakable. You can drop it form any height and it will survive, without a scratch. 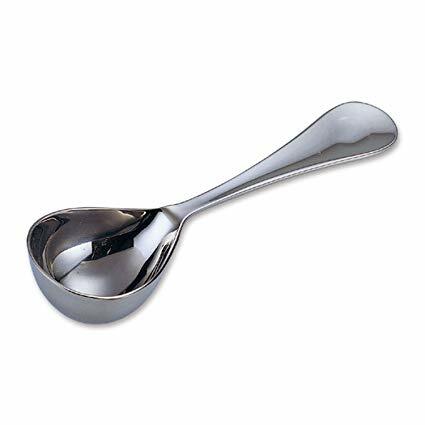 Stainless steel scoops are also long-lasting. 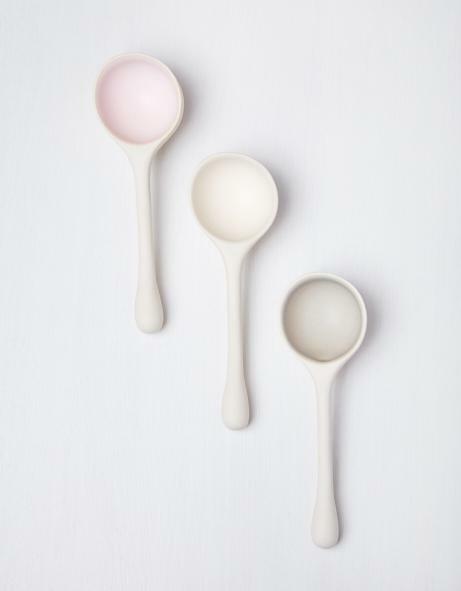 Unlike plastic scoops, they won’t easily scratch or stain. As the steel is stainless, they won’t rust or change color either. They are really easy to clean. You can hand wash them or throw them into your dishwasher. There you go! Now you know what type of a coffee scoop is the best. 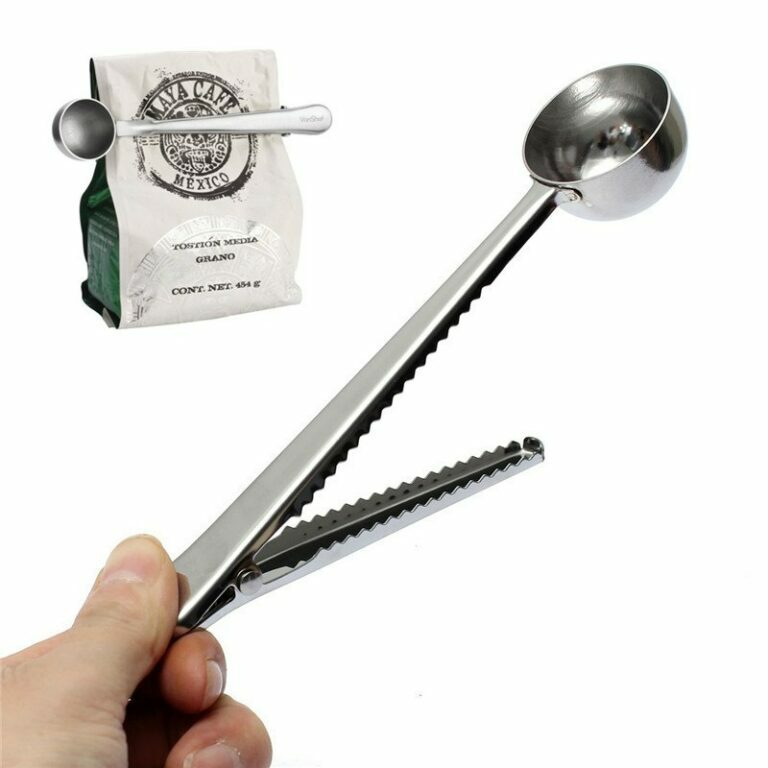 This amazing coffee scoop is made of 18/8 stainless steel. It is durable and long lasting. The scoop measures exactly 2 tablespoons. The scoop can be washed in a dish washer. It weighs 1.6 ounces and has dimensions of 7 x 3 x 1.4 inches. 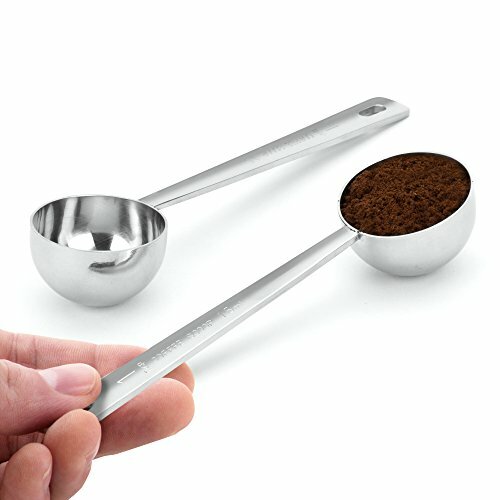 This stainless steel coffee scoop is beautifully designed and made to last. It measures 2 tablespoons. It has been voted the best coffee scoop manufactured by Coffee Gator. This premium looking coffee scoop is manufactured in one piece, meaning the handle will never fall off. Great feature about this scoop is that it includes easy-to-read imperial and metric size markings. Thanks to these makings, you will always measure the exact amount of ground coffee you want to use. That’s it! We hope you enjoyed reading! Now, go and treat yourself with a home made cup of coffee! There seems to be some confusion about what this question actually means, and so we try our best here to clear things up. Anyway, I know it’s easy to adjust but curious about the 8 oz vs 6 oz of water questioned above. This is perhaps where some confusion comes from! The people saying a tablespoon for 6 or 8 oz of water are just trying to sell coffee and are not trying to make it taste good. 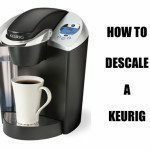 Try 3 level .25 oz scoops per 12 cups in a standard drip coffee maker and taste the difference. So 1 1/2 Tablespoons for a 12 cup pot? That doesn’t sound right. I Find that 7 to 8 grams of coffee to 150ml cup makes a pretty good Americano or Coffee Crème, I increase it to 8 to 9 grams with 100ml water and 60ml froth for a Cappuccino, for Longs I use a double Shot (14 Grams). I use three different machines with the same recipe, Manual Krupp’s, Delonghi Prima-donna, and a Melitta Barista TS. Just use a good strong coffee, medium to dark roast depending on taste, Normally use a slightly darker roast for Milk based coffee’s.